The other week I went fishing with my dad. He’d been hounding me to go with him for, well, a few years, and I’d been dragging my feet. It’s an all day commitment and I seem to never have a lot of spare days, but also the last few times I went we never caught anything. Fishing can be a lot of fun, or it can be extremely uneventful. Thankfully this trip was a lot of fun! We did have some good activity, but most of it we had to throw back – 3 rays, 1 small flounder, 1 blue fish that I let get away as I brought it up to the boat, 2 cobia who eyed the bait but just wouldn’t bite, and, luckily, one small/medium size blue fish that I did successfully get into to boat and we kept! My dad was determined to catch me enough fish for my husband and I to have dinner, so the next day he went back out by himself and caught a few speckled trout and croaker. The result was an excellent dinner. Earlier in the week before the fishing trip I bought a flounder fillet at the grocery store for dinner. The difference between fresh fish and store bought fish is amazing. Good fish doesn’t take long to prep or cook. 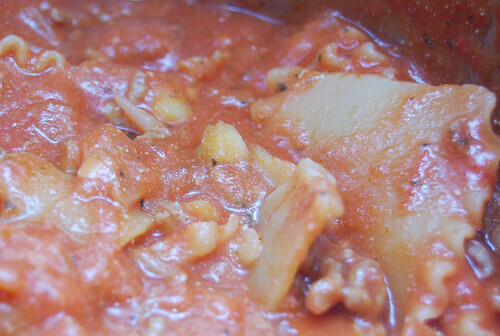 This recipe will work well for any small to medium size white meat fish. 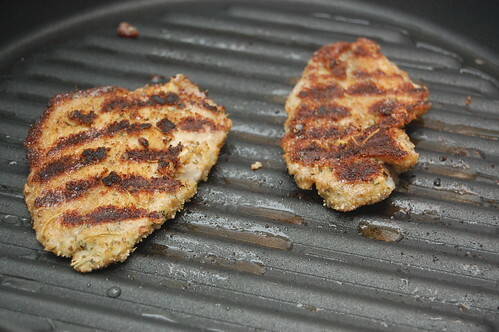 Heat a grill pan on medium high heat. 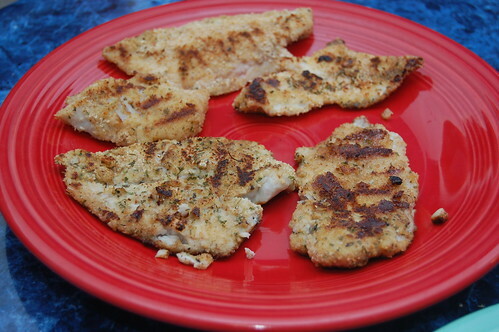 Combine all ingredients except fish and egg and make a thin layer of the spice/bread crumb mixture on a plate. Crack open an egg and whisk it in a small bowl. 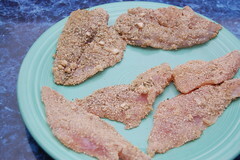 Coat fish fillets one at a time in the egg and then dredge in spice/bread crumb mixture. 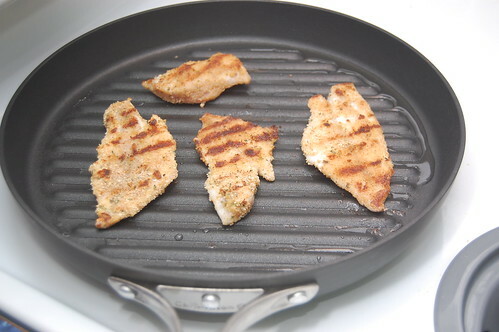 Add coated fillets to grill pan and cook small fillets for approximately 3 minutes on each side, watching carefully to be sure you don’t overcook. 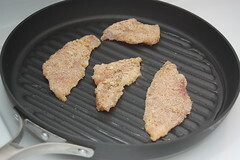 Fish should be opaque when done; use a small fork to test that fish just starts to flake when touched. Serve with whole wheat couscous and asparagus. As a kid I never had much of an issue with most vegetables. Asparagus: sure; broccoli: yum; spinach: uh, Popeye? I suppose when you have a German mother who enjoys delicacies such as red cabbage and sauerkraut, other things don’t seem so bad (if you’ve never experienced the process of cooking red cabbage, trust me on this one). 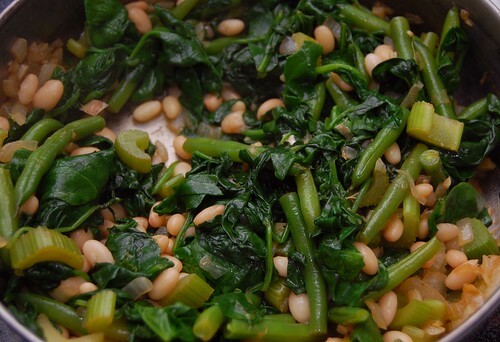 I wanted to make a green salad with white beans this weekend, but couldn’t come up with the right inspiration. Every where I looked for inspiration just took me down a different path for a latter potential recipe. I still haven’t come up with one but in the meantime I found this to tide me over. 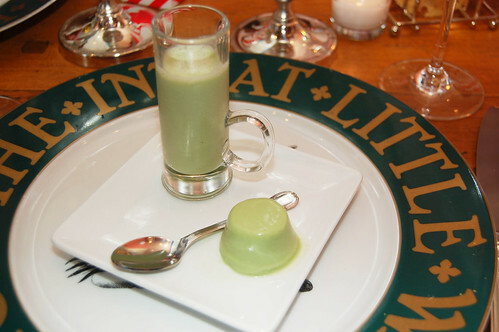 The ingredient list is short, the recipe is simple and mixes green with bean, technically. Feel free to try a different kind of white bean. 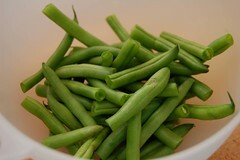 Boil the green beans in boiling salted water for 3 minutes then immediately drain and dump in ice-cold water. Drain and pat dry. Sweat the onions and celery in a large pan with the oil for a few minutes. Add the garlic and paprika, continuing to sweat until the onions are soft. 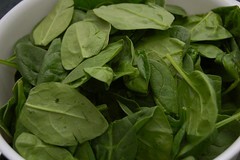 Add the spinach, cover and cook until spinach wilts. Note: if you picked a pan that’s not quite large enough, be sure to stir the spinach occasionally. Add the beans along with 1/2 cup of water and simmer for 20 minutes. Serve and enjoy. The week that my husband and I moved, I carved out a little time for a “ladies night” with some friends. We planned a low key evening of dinner and drinks at Uncle Julio’s followed by a romantic comedy, “Ghost Town,” which was rated by Paste Magazine as one of the 17 Best Romantic Comedies of the Decade (it wasn’t). 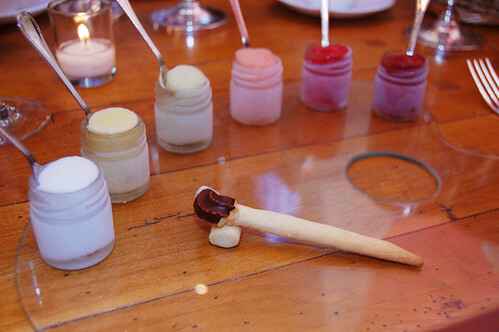 During the dinner portion of the evening, I found myself asking a lot of questions about what things were. My friends were pretty surprised by this, and they demanded that I dedicate a post to understanding Mexican food. Gladly! I hope this list helps all of you as much as it helped me! Please note that these definitions are generalizations that apply to Americanized Mexican food, and of course there are variations. Quesadilla – A tortilla that is filled with cheese (queso), folded (not wrapped) and cooked until the cheese melts. Chorizo – A fatty pork sausage. Tamales – Can have a variety of fillings including meat, cheeses, vegetables or chilis, but it is generally steam-cooked corn dough wrapped in a softened corn husk before cooking. It is tied together and steamed until the dough is cooked, and the corn husk is peeled back before eating. Fajita – Marinated grilled meat cut into strips on a corn or flour tortilla, often with peppers. The tortilla is usually then wrapped. Burrito – A flour tortilla folded and rolled to completely enclose the filling (generally beans, rice, cheese and/or meat). Taco – Usually a hard, folded corn tortilla stuffed with various fillings like meat, cheese, lettuce, etc. Enchilada – A softened corn tortilla folded around a filling (the ends are left open, unlike a burrito). Often topped with a tomato-based sauce and cheese. Chile relleno – A roasted poblano pepper stuffed with cheese and sometimes meat. 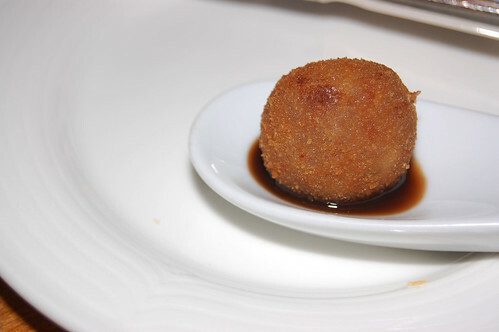 The pepper is dipped in a batter and fried. Taquito (or flauta) – A small, thin, rolled up tortilla (usually with a meat filling) and fried until crispy. Chimichanga – A fried or deep-fried burrito (ends tucked in). Also filled with similar ingredients to a burrito. If you were a student at Virginia Tech, chances are you spent some time at the Squires Student Center in the north eastern area of campus. It’s home to the University Unions & Student Activities (the organization in charge of all student organizations as well as many campus wide events), the music department and a good place to meet and hang out. Squires was also at the edge of campus, a short walk to downtown Blacksburg. 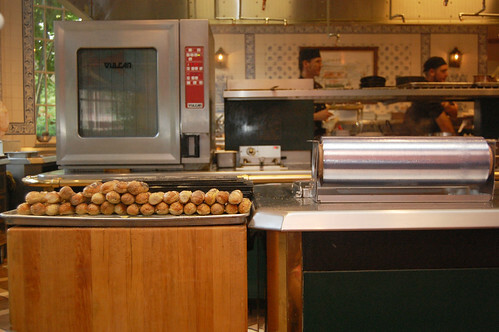 One of the downtown places to catch a quick and tasty bite is Souvlaki. They have excellent pita wraps with cucumber sauce called Tzatziki. Mmmmm…. For some reason I was thinking back to my times at Tech recently and the regular, uneventful moments. The ones where it’s you and a few of your friends hanging, not really doing anything. Maybe watching TV, maybe having a drink, maybe grabbing a bite. Souvlaki’s was one of those placed I did that. So in the interest of bringing back old memories I decided to have a go at making my own vegetarian version of their souvlaki pita. Now they have a vegetarian item on the menu, but back then I was more of a meat eater so I threw tempeh into the mix. The result? Pretty tasty but not Souvlaki. There’s no denying that meat is a great flavoring agent for the ingredients it’s added with. Give it a whirl, though. I enjoyed it. Uses the larger hole sizes on your grater so the cucumber shavings don’t slip through the colander’s slots. Toss the cucumber in a colander and hand mix in the salt. 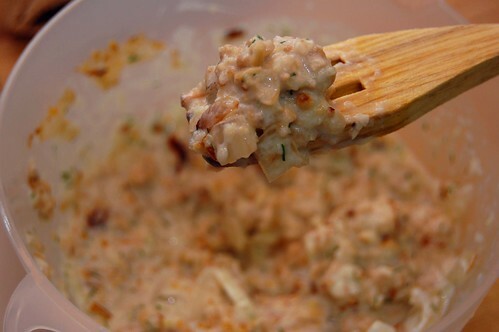 Press some of the liquid out and throw in a food processor. Add the yogurt, lemon juice, garlic, dill and process till smooth. Saute the onions for a couple minutes then add the tempeh and continue to saute for a few more minutes, adding more oil if necessary. 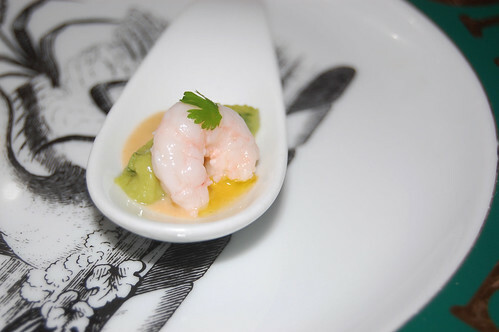 Remove to a bowl and add the cucumber sauce until you reach your desired consistency. 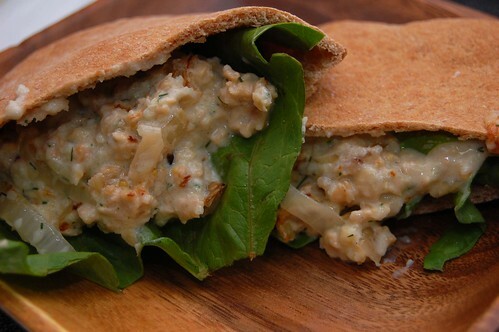 Fill your pita with lettuce, tomatoes and anything else you like in your pita sandwich before adding the tempeh. Enjoy. 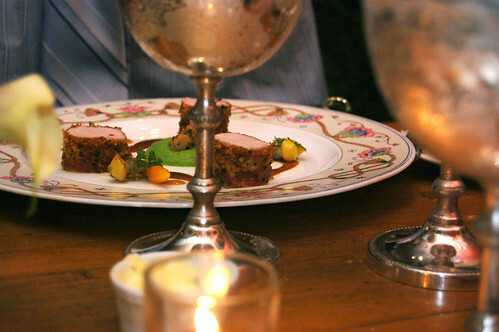 Last night I had the pleasure of having dinner at The Inn at Little Washington, a foodie haven about 70 miles from Washington, DC. If you’re not familiar with The Inn, check Wikipedia for a listing of the many, many awards it has received. 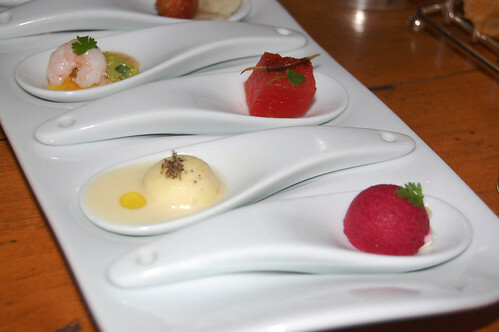 For starters they brought us a sampling of canapés. I believe this one was cheese. I grabbed this one, filled with risotto. 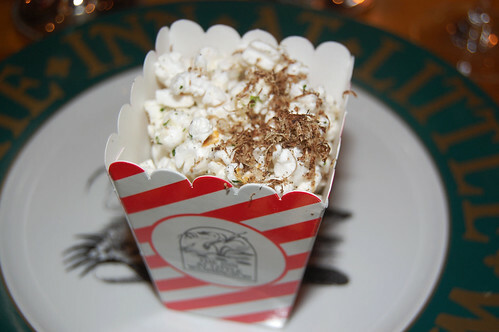 Herbed popcorn topped with shaved truffles. Morgan informed me that this is how he would like his popcorn from now on. 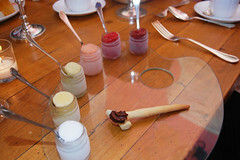 They brought this between the canape and our first course. They referred to it as “sorrel,” and it did, in fact, taste a lot like grass! A Quartet of Island Creek Oyster Slurpees. This was by far my favorite thing all night. I’d never had anything like it, and it was amazing. 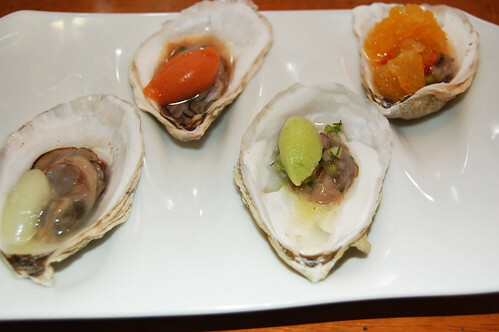 The oysters were each filled with a dollop of either cold grapefruit, passionfruit, cucumber puree or wasabi slurpee. Amazing. 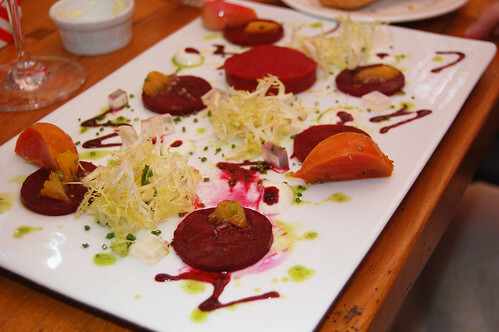 Beet Fantasia: Three Varieties of Roasted Beets, Beet Mousse and Citrus Salsa. 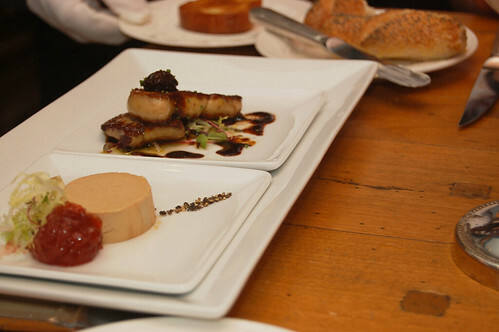 A Marriage of Hot and Cold Foie Gras with Ice Wine Jelly and House Made Quince Preserves. 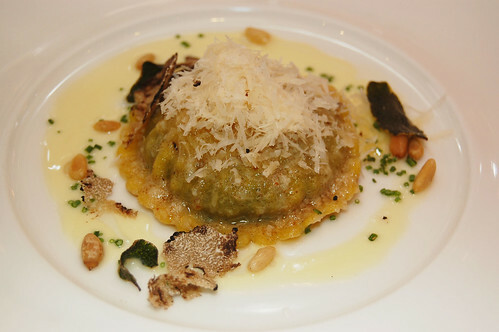 Spinach and Cheese Filled Molten-Gold Ravioli with Shaved Summer Truffle. I wanted to love this, but there was a lot of runny egg inside that overpowered it a little more me. 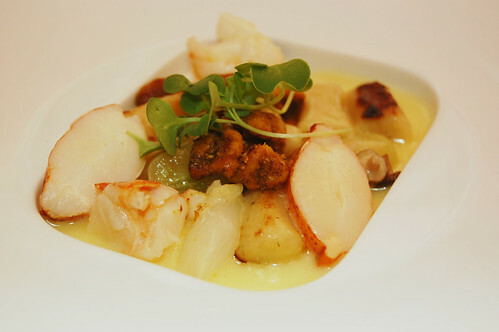 Fricassee of Maine Lobster with Potato Gnocchi, Green Grapes and Curried Walnuts. 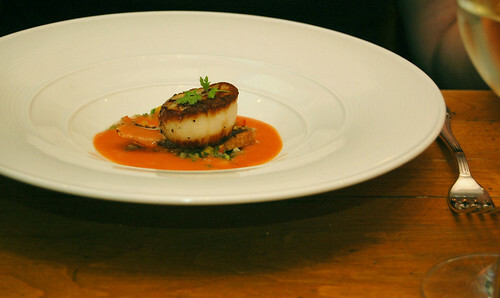 Pan Seared New England Diver’s Scallop with Black Olive Tapenade and Gazpacho Salsa. Medallions of Rabbit Loin Wrapped in House Cured Pancetta Surrounding a Lilliputian Rabbit Rib Roast Resting on a Pillow of Pea Puree. I peered through the giant water chalices to take this photo. The rabbit was amazing. 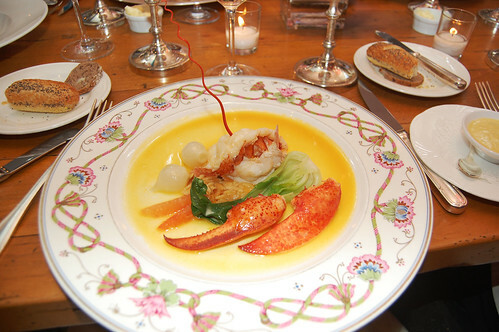 Pan Roasted Maine Lobster with Braised Baby Bok Choy, Grapefruit and Citrus Butter Sauce. 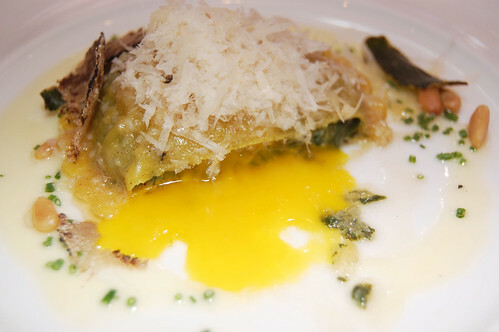 This was my main course selection – very excellent but at this point I was very stuffed! 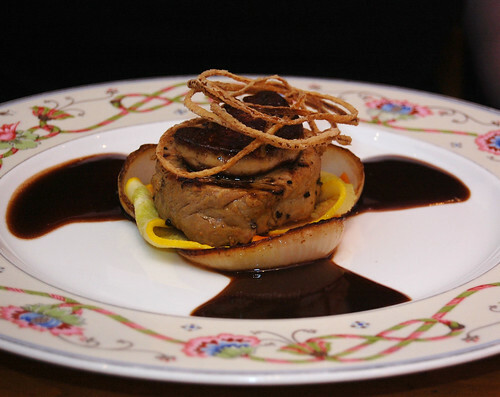 Pepper Crusted Tuna Pretending to be a Filet Mignon, Capped with Seared Duck Foie Gras on Charred Onions with a Burgundy Butter Sauce. 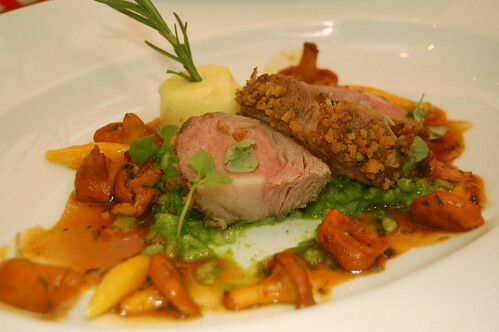 Elysian Fields Baby Lamb Loin with Parsley Risotto, Chanterelle Mushrooms, Garlic Custard and Minted Bearnaise Sauce. 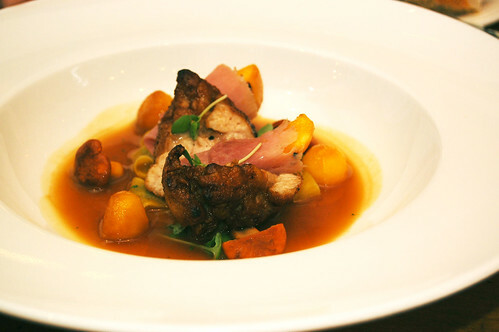 Crispy Sweetbreads with Grilled Local Peaches, Chanterelle Mushrooms and Virginia Country Ham. 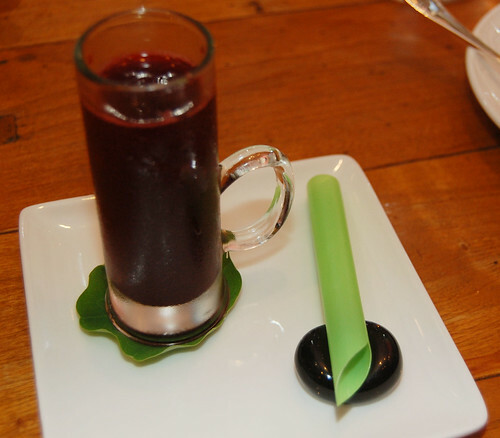 After dinner and before dessert – some kind of delicious blackberry drink with tapioca. 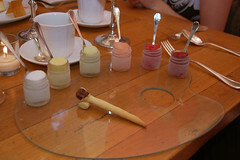 A Painter’s Palette of Seasonal Sorbets. I didn’t get to try as much of this as I would have liked. My husband ordered it, and he said he would almost eat the glass it was sitting in to get every last drop. 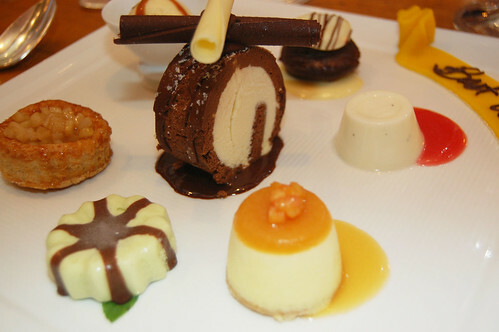 Seven Deadly Sins, A Sampling of Seven of Our Most Decadent Desserts. What I picked – of course! 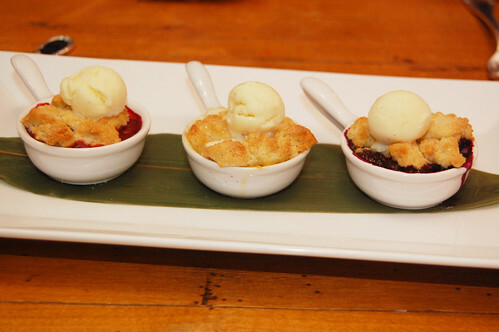 A Trio of Summer Cobblers: Local Blueberry, Peach and Cherry with Buttermilk Ice Cream. 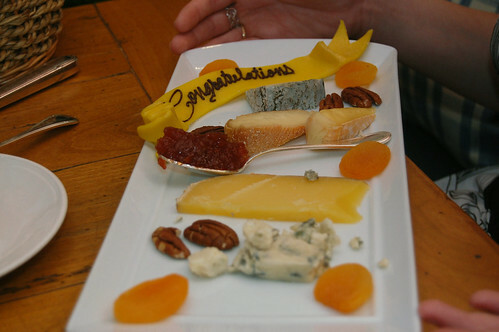 For a Selection of Today’s Cheeses, Just Ask for Faira the Cow. We did.. and they brought it! 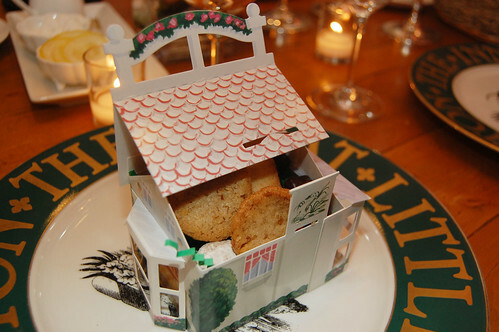 A favor box of assorted cookies and chocolates to end the night, in the shape of The Inn. As you can see, I will not be eating for the rest of the week! 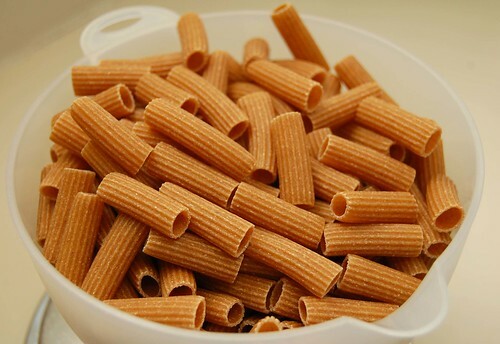 Have you cooked with whole wheat pasta? I must admit, I’ve done very little with it. It got a pretty bad wrap when it first came out. I believe I heard the comparison to cardboard being thrown around more than once, which isn’t a great selling point. But whole wheat pasta has come a long way (or so I’ve heard) and sometimes there’s nothing simpler than boiling some noodles in a pot (what? I’ve been sick. leave me alone). 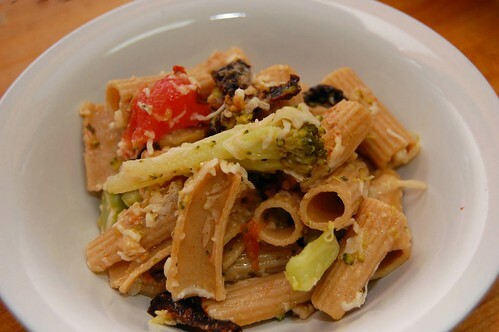 I remember having this really delicious whole wheat pasta salad a few years back at a park cleanup project I attended. 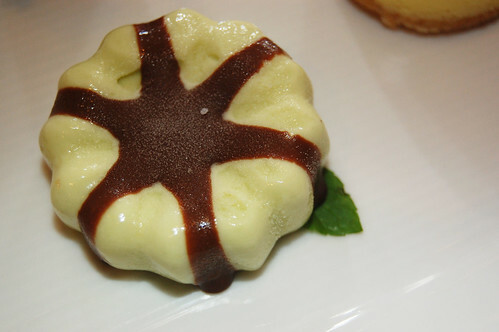 Sadly, I don’t know how it was made but it is what I attribute the inspiration for today’s recipe to. This dish also introduces something I cook very rarely with: sun-dried tomatoes. It’s something nice to have in the pantry when you’re looking to add a little more tomato flair to your meal. I used sun-dried tomatoes without oil, but feel free to use the kind with. Just keep in mind the amount of additional oil you add. In a large pot of boiling water, blanch your tomatoes for 30-40 seconds and remove with a slotted spoon or tongs. Once cool enough to handle, peel and cut along the equator. Remove the seeds, roughly chop and set in a small serving bowl. Mix in the oil, red wine vinegar, basil, garlic, sun-dried tomatoes and lemon juice. 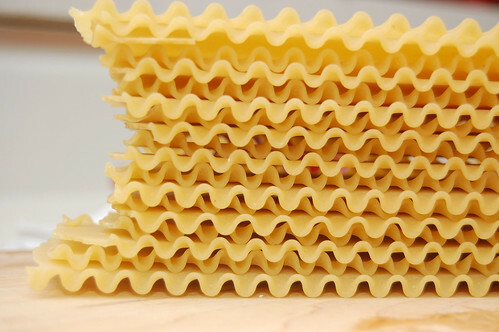 Bring the pot back to a boil and cook your pasta per the package’s instructions. When you have about 5 minutes left, add the broccoli. Strain when ready and place in a large bowl. Add the “dressing,” mozzarella and toss to coat. Add parmesan if you so desire, serve and enjoy. Lasagna Skillet, aka Lasagna "Giant Pot"
Like the English Muffin Pizzas I posted at the end of last month, this recipe is also from that stage where Morgan and I were trying to clean out our kitchen before moving. And while we’re on the subject of moving – yes, we are all moved in to our new place in Charlottesville and it’s gorgeous here. Unfortunately we’re not all unpacked yet, but we’re getting there (slowly). The kitchen is finally done, and I’m looking forward to jumping back into the DinnerCakes saddle! Back to today’s post, we had some beef that had been in the freezer for awhile, lasagna noodles in the far reaches of the cabinet and a stray zucchini to use. 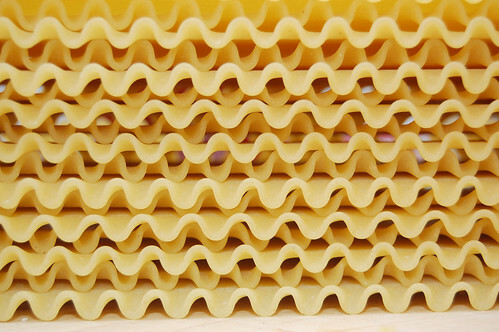 Morgan loves, loves, loves lasagna, but we never make it because of the fat content plus time commitment. But like I said, we were moving within the week so everything had to go! 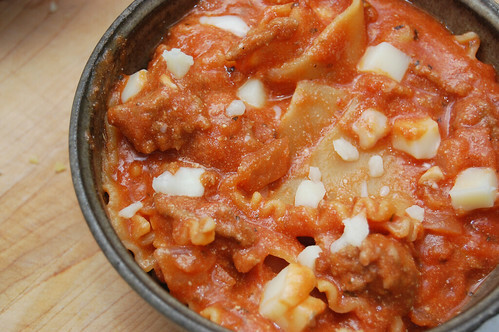 A long time ago I remembered making something called “lasagna skillet,” a less elegant version of lasagna where the noodles are broken up into fourths and everything is cooked together in a skillet. I decided to make something similar, but because of the massive amounts of ingredients (yep, if you’re cooking for two like me you will have leftovers – but they’re delicious leftovers!) I couldn’t fit everything in a large skillet so I used a large spaghetti pot. It would be even more inelegant to call this dish lasagna “giant pot,” so let’s just stick with lasagna skillet. 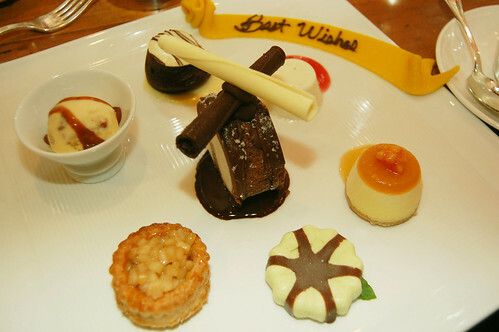 This dinner really surpassed my expectations and we both enjoyed it very much. It came in handy for both lunches and dinners the next few days, and the leftovers are great either cold or warmed up. Enjoy! Stir together beef, onion, zucchini and garlic in skillet over medium-high heat, about 5-6 minutes, until beef is brown; drain. Add ingredients to large pot and stir in water, sauce and lasagna noodles, quartered. Bring to a boil, folding the mixture over the stiff pasta, then reduce heat to a simmer and cook uncovered for approximately 20 minutes, until noodles are cooked (Note: It will seem like a lot of water, but it gets absorbed as it cooks). Add ricotta when noodles are almost completely cooked. Sprinkle with mozzarella before serving. Comments Off on Lasagna Skillet, aka Lasagna "Giant Pot"
Gather ’round children, and we shall explore the wonderful world of zesting. Last week I shared a recipe that called for lemon zest, so today we’ll learn what it is, how to get it, and pitfalls to consider. Zest is the (very) thing skin on citrus fruit like oranges, lemons and limes. 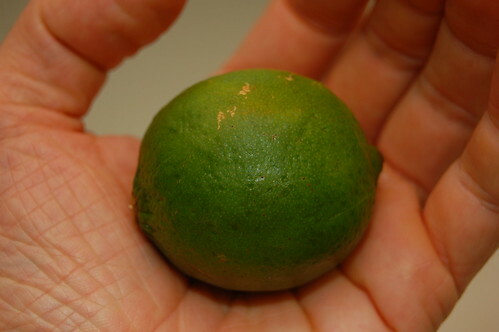 Containing oils, zest has a strong citrus flavor, and is most commonly used in desserts such as cookies or pies, but can be used in other things such as drinks and salads. Growing up, my mother would bake “orange peel” cookies, which often perplexed me. “Isn’t the peel garbage?” Not so! 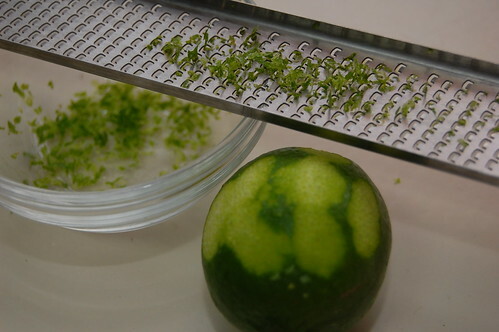 The best tool for zesting is a microplane grater, but a standard grater can work as well (using the side with the smallest holes). Just delicately grate the color off your fruit. You can even peel it of with a paring knife and a steady hand. The only thing to be careful of is the white stuff under the color, called pith. Pith is bad. Pith is the weird uncle, that one that is a little…. off. Pith is bitter and can really ruin your dish, so be sure to only take the zest and not the pith! Feeling adventurous? Want to practice your newly acquired skill? Here are a few recipes that use the mighty zest. 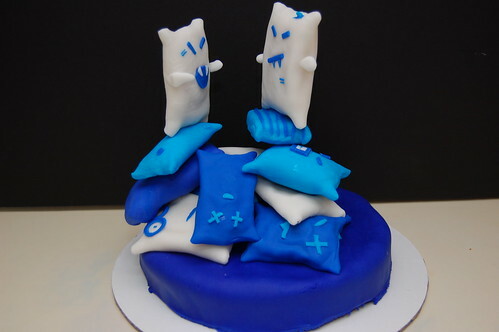 Hope you enjoyed yesterday’s post from Edwin of his “Pillow Fight” cake submission to the Threadcakes competition. 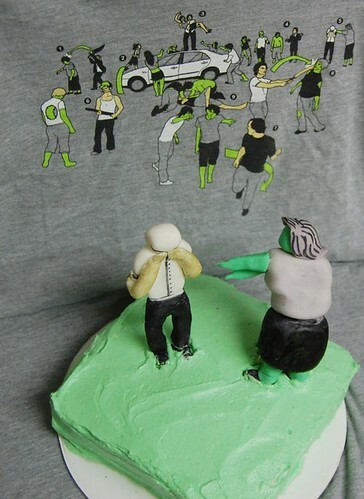 The competition challenged bakers to make cakes inspired by a Threadless t-shirt. I also submitted a cake modeled after one of my favorite Threadless shirts. Winners will be announced next week, and there was some seriously intense competition (this is my personal favorite – how did they do it?!!). This competition was definitely a learning experience for both Edwin and myself!